Hello and welcome. Today I have another project for Mother's Day using the Have a Cuppa suite of products from Stampin' Up!, including a full video tutorial and some tips on how to use those super cute embellishments on your projects. I absolutely love these simple fold cards, you get stunning results for very little effort and the gorgeous paper and die cuts can do all the talking for you. 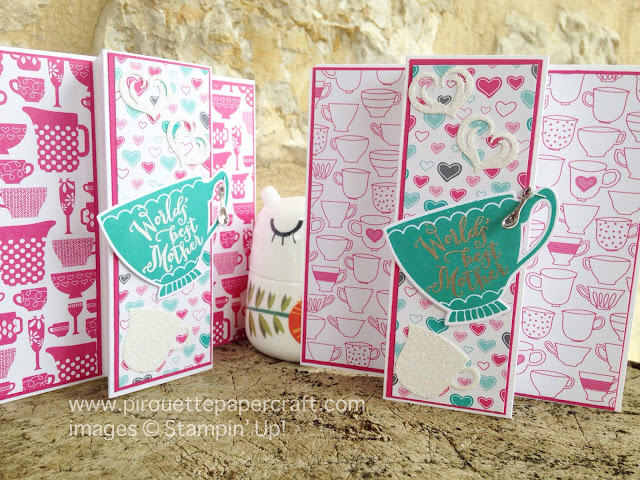 Don't forget that you can Bundle & Save 15% of the Stamps and Dies set - and also it's Sale-A-Bration - for every £45/60€ you spend you get to choose a free Sale-A-Bration product ! So it's time to treat yourself and start crafting!